177+/- acre Hunting Tract in Worth County, GA that has the famed Warrior Creek which is know for its quality Whitetail Deer Hunting. The property is adjacent to farms on two sides providing year round feed to the game that travels the Warrior Creek Hardwood corridor. The Creek gives a consistent water source that attracts game like nothing else and offers excellent wood duck habitat. There are atv trails that give access to a the property and could easily be improved for additional access. 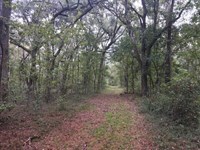 Two power line right of ways cross the property offering great hunting and additional food plot locations. There are several small food plots scattered in the mature Hardwood forest/. The 177 acre property has all water rights, mineral rights, oil and gas rights included. Located approximately 2 miles east of Sylvester, GA 31791 off of Hwy. 82 near the city of Poulan. Property has multiple paved road frontage points as well as easy access to power. Hunting opportunities include excellent whitetail deer, turkey, & duck hunting. Property would be excellent for weekend getaway/hunting trips. Additional property available. Mixed use recreational, timberland-hardwood/pine for sale in Worth County, GA. For more information contact Scott Dawson with Mossy Oak Properties at. When calling agent, please say, "I found your listing 177 Acres Hunting Land For Sale on FARMFLIP."